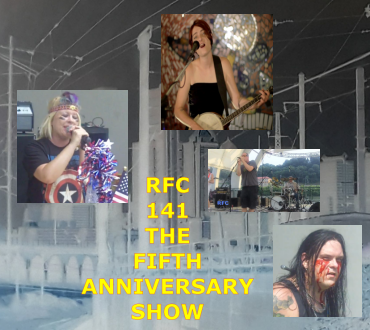 With our three-month excursion into the depths of our FestivALL archives concluded, we now return to our chronological presentation of classic episodes of Radio Free Charleston, picking up with our massive fifth anniversary show, from July, 2011. Of special note, this episode was filmed almost entirely outdoors, in severe heat, years before I had been diagnosed with Myasthenia Gravis, but years after it had first mainfested itself. That disorder leaves me extremely susceptible to getting sick when I’m in the heat for a prolonged time. At the time, I wondered why I felt so bad for the week after shooting all this stuff. Now I realize how much I was putting my health in danger to produce this show. So enjoy it here on video. I’m never doing this again. It was a pretty epic show. The original production notes can be found HERE. Next week marks the seventh anniversary of this fifth anniversary episode of the show. To celebrate this we had planned to hire Jeri Ryan, the actress who played “Seven of 9” on Star Trek Voyager, to make an appearance at a local branch of Fifth/Third Bank to sign containers of Half and Half while we played Chicago’s “25 or 6 to 4,” but we couldn’t make the numbers add up, so we just reposted this video. Officially, the first video episode of Radio Free Charleston debuted on Charleston Newspapers server on July, 4, 2011, but the truth is it was actually up and running on June 30. So happy damn birthday to us. Maybe I’ll make a new episode sometime this year.